Live Graphic Recording Time Lapse Video - Graphic Recording and Facilitation for your meeting, conference, or event. Fortune 100 clientele. Studio illustration and infographics. Click on the photo to play a 15 second TIME LAPSE VIDEO of a 45 minute breakout session. 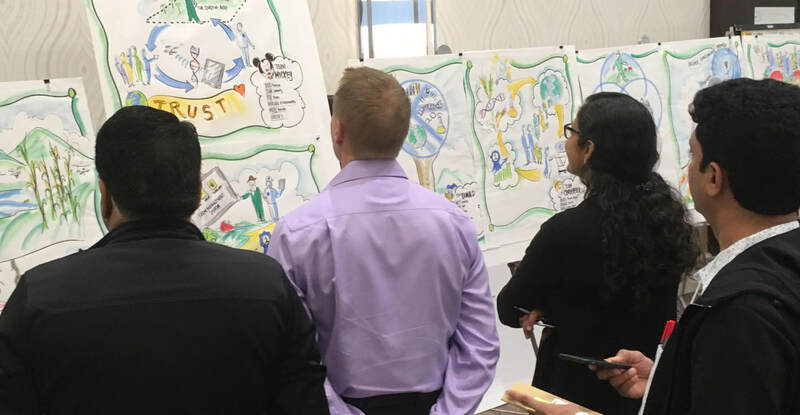 As a Visual Facilitator, I listen deeply and draw live during your meeting or event, visually summarizing ideas, key points and connections for your participants to engage with during and after the event. During strategy sessions, report-outs, panel discussions, or any interactive group process, the visuals I create help increase individual and group understanding, retention, buy-in and takeaways. Visual work helps everyone share ideas, see other points of view, feel heard, and share their common experience. The final piece of art gives the group a unique way to share their accomplishments with others, or revisit their process with rich recall of key points. LOCAL to NYC, BOSTON, and most of NEW ENGLAND. Traveling nationally. Graphic Recording and Facilitation for your meeting, conference, or event. Fortune 100 clientele. Studio illustration and infographics.